When November rolls around, it seems every store you walk into has gone all out to celebrate the holidays. There’s no escape from the decorations, the holiday sales, the festive music. For most people this is a happy time, but if you’ve recently lost a loved one, the holidays can be especially painful – and coping with grief takes a little more work than other times of the year. But when you feel like you just can’t take another sleigh bell or holiday carol, just remember, you grieve because you had the courage to open your heart up to love. That same love is what will get you through the tough times, when that same heart feels like it’s breaking. Sometimes feelings get to be too much around the holidays. People all around us are celebrating, reuniting with loved ones coming home for a visit, exchanging gifts, and expecting everyone to be as happy as they are. When you’ve lost someone, it’s hard to get in the middle of all that good cheer. All the celebrations and laughter sometimes make the sadness and loss seem bigger. 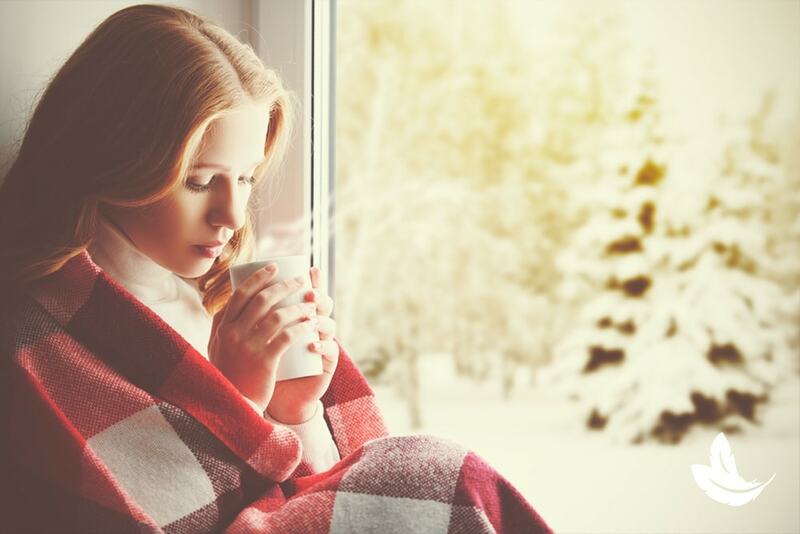 It’s natural to miss your loved ones more over the holidays, and it’s important to have good coping mechanisms to deal with your grief and feelings of loss. Get through the holidays your own way! Instead of shopping for gifts or planning a big meal, they pooled their resources and got reservations at a nice restaurant and went there after their dad’s favorite Christmas Eve church service. They talked about memories of their father and enjoyed just being together. On Christmas Day, they slept in and went to the movies. They had so much fun, and everyone was so relaxed and happy, that they decided to do it again the next year. I have another friend who travels during the holidays. “I miss my husband,” she tells me, “so instead of going to parties and pretending to be happy while wishing he was there with me, I get on a plane and fly somewhere we always wanted to see.” She takes his favorite sweater with her. “He comes with me,” she says. She’s found a way to connect with her husband and cope with the difficult holiday feelings. Of course, not everyone can just leave town or skip the holidays altogether. There are other ways to cope during difficult times like these. Helping others by volunteering somewhere is always a good way to get a break from your own feelings. Being around children is another wonderful way to remember how to feel joy. Parents are always overwhelmed at the holidays. Give Mom and Dad a break and borrow their children for a day. Go skating, check oiut the holiday lights, or build a snowman. Experience the holidays through their eyes. You’ll be surprised how easy it is to “catch” their joy. Whatever you do over the holidays, remember your loved ones are always with you, and the grief you feel is just a reflection of the love you share. Let that love lift you up, share it with others, and find a way to stay connected to your loved ones this holiday season. I am missing my Grandfather this Holiday Season. Thank you for always knowing what to say. I miss my family in Heaven so much. Coming to your shows have reminded me that they are always with me. We lost 3 of our family members this year. I shared this post with them the moment I read it. I hope it helps them as much as it helps me. I really enjoyed reading this last post of yours but as much as I try I don’t know if i’ll be able to apply your suggestions. My husband has been gone 15 months already and sometimes this feeling in my gut is overwhelming . I can’t seem to let go of the if I only was in the room at the moment he left, if I had only told him I was trying to forgive him for the wrong he did to me well over 15 yrs ago and then I feel the guilt. I was 17 and he 27 when we married and fought through good and bad for 54 years, alcoholism,infidelity and whatever I still loved the guy. He passed at home, I took care of him the best I could but there’s always that what if. Hey it’ll get better I know i’m just not the most patient person. You always get in touch at the right time. In my car this morn I heard that special song my drummer grandson had mastered & the dam broke & the tears fell out. At home now Im feeling drained when I got your post. Thank you Matt. You help me right on time. God Bless. Thank you for these uplifting words, Matt. Our loved ones would want our love to go on and continue to finding joy. Thank you. I miss my Mom. Today would be my parents’ 61st wedding anniversary. They were together since they were 16. They prides themselves on never having one fight. And they didn’t. I don’t know how my Dad is managing. I am trying my best, but some days I’m sad. I have a friend who just lost her Mother..Im sharing this with her. Thank you Matt see you in April on Long Island ..
My dad passed away On November 22 12 years ago Thanksgiving morning. On Christmas Eve I take his ashes and place them in my leather jacket and take him for a ride on my Harley. That is how I cope. Thank you Matt for these words of comfort. My husband died July 2017. I was numb the first Christmas but this holiday time is really hurting. I appreciate your words and I will try to work thru this season for my daughter and grandchildren. I miss my husband and mom and dad so very, very much. I have no immediate family.Christmas was my husband’s favorite holiday. He decorated the the house so beautifuly.i wish he would send me a sign. Nothing from my mom and dad either. So lonely. Crying as I write this. Thank you for uplifting message. Thank you Matt. I lost my son last year 2017 who was a Army Veteran. I know he is in Heaven with all our family and friends. I will look forward in receiving your kind words. thankyou. I lost my sister a week prior to Thanksgiving nine years ago, and it is still a very tough holiday to get through. But I feel her presence every day, and I know she is with us in spirit in everything we do. My parents and she send me subtle signs from heaven, and I welcome them always. It makes it a little easier knowing they are there. Thank you for your suggestions. I cannot apply them either in my situation as both my Dad (2014), Mom (2016) and my only sibling (1999) are all together up in heaven. So I basically do not have any family here for the Holidays. Have been not enjoying them since 2016. I breath a sigh of relief when the holidays are over. Hi Matt. Thank you for the kind words. I miss my family and friends that past on long time ago.lost my two brothers not long ago. When I came to your event I was connected with my mom. Now I always feel her with me and I know they are all together in heaven. Even though we have not met I know you are pure and true Matt. The gift you share is truly a blessing to each recipient. May each and everyone you reach , as well as you and your kin, enjoy a loving memory filled christmas befitting each ones circumstance. I lost my beloved Daddy on Dec 10, 2017. I miss him so much every day and I would give anything to hear from him. The holidays are very hard this year. Last year we were all in shock, but this year the whole family is really feeling his absence. Thank you Matt your right the holidays are the worst. I hate the holidays any more. I did have a good holiday with my family. And hope you had a good Thanksgiving also. It always helps when I’m with friends and family. And talk about all the good memories we had with our love one’s.